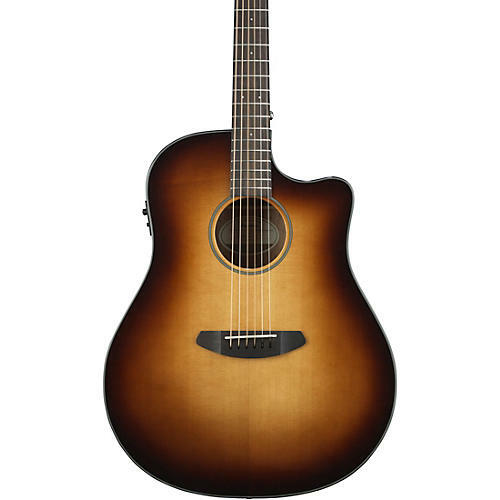 The Breedlove Discovery Dreadnought with Spruce Top Sunburst Acoustic-Electric is ideal for beginning players seeking a big, robust sound they can plug in. The larger body shape moves more air, inviting heavier play. It has the same easy to play neck dimensions and design as the Concert models. Includes gig bag. This is an ideal first guitar. Beginner-friendly design elements include a narrow nut width, radiused fretboard, thinner neck profile and Delta bridge for easy string changes. Crafted with Breedlove sound DNA, these instruments sound like guitars at three times the price. Each one is set-up and quality checked in Bend, Oregon and includes a Lifetime Warranty.